Our food budget is usually one of the biggest sections of our budgets, especially if you have a lot of little mouths to feed. Often times when we track our spending we'll notice that a good portion of our budget is going towards food. This was true for our family when we first got start on our budgeting journey about 3 years ago. 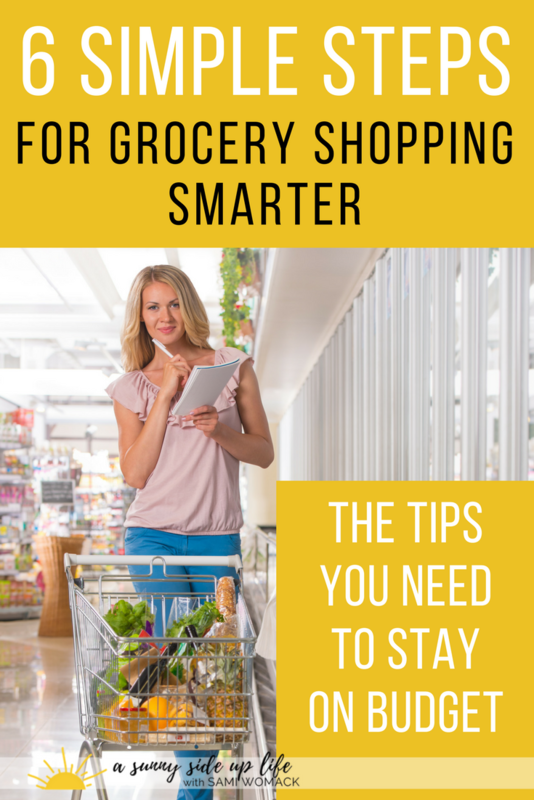 Not only were we wasting money eating out too often, but when we did grocery shop + eat at home we ended up wasting money there too because we hadn't learned how to grocery shop smarter yet! The good news is that our food budget is the most flexible area of our budget. We can easily choose to eat out or cook fancy meals and spend thousands of dollars a month on food...or we can shop smart + be super frugal. It's up to us! How well we grocery shop is crucial to our food budget, and therefore crucial to our entire budget + ultimately our long terms goals for becoming debt free or saving money! Throughout the week keep a notepad and a pen handy in the kitchen or use the notes in your phone, and jot down an item as it gets low or as you randomly think of it. This will help keep you from feeling overwhelmed when it's time to make that grocery list later in the week. Making a meal plan is simply planning ahead what you're going to eat each day for each meal. This helps us be intentional with the food we eat + the money we spend on that food. This step held me back for so many years! I used to do grocery runs and just impulse buy. I'd get home...I'd have no real meals, I'd be missing ingredients, or I bought a duplicate item of something I already had. Creating a plan ahead of time is HUGE for your budget + your sanity! If you're brand new to meal planning then I'd highly recommend Let's Make Meal Planning Simple. I love this step-by-step guide that my friend Christine from The Mostly Simple Life created. It's full of expert tips, full pre-made meal plans, + all of the worksheets you need! Once you know what you need for the week. Take the time to rewrite + organize your shopping list. Walk through the store in your head, make a column for each different section, + then fill in your needed items under it's correct section. This part you'll of course want to make specific to your store + your list. If you don’t buy your household or pets items at your grocery store then you'll want to make a separate list for those items. Let's Make Meal Planning Simple also includes a great pre-made grocery list to help you stay organized. After you're all organized then you'll want to look for coupons. I do it in this order so I'm sure to not add an item to my list just because I have a coupon for it. Tip for Success: Keep your coupons paper clipped to your list, in your pocket, or somewhere else that'll be easy for you to double check them while you're shopping...just in case you need to check a size, quantity, or brand. Next, go through your list + make notes. I'll usually draw a star next to each item that you have a coupon for, and I'll make small notes next to items that I'll need a specific size or quantity of. This really helps me stay on track while I'm shopping. If you have young kids, like I do, you know that this can be a chaotic hour or so...and honestly, it's one of the most challenging parts of my week, but I know that it's really important to my budget that I take this seriously. Don't buy things you don't need...stay focused on your budget! Luckily, shopping with kids helps cut back on browsing the aisles and buying things that you don't really need! It does, however, make it very difficult to do the math on items to figure out the best deals. I know it’s hard when we’re tired, or your toddler is grabbing everything in sight. Try to remember that groceries are one of our budget categories that we have the most control over! Make this work to your advantage! Shop smart and with the goal of sticking to your budget in mind!